Have you been thinking about buying an electric pressure cooker? Maybe you’ve heard of the Instant Pot 7 in 1 uk version and you’re wondering if it’s worth paying a bit more for it than other electric pressure cookers. Well today I’m going to be discussing the pros and cons of the Instant Pot Duo so that it might help you with your decision making, it is also our top choice in electric pressure cookers. The Instant Pot is a 6 litre pressure cooker with other cooking options available which offers an appliance that you can use on a daily basis in different ways. One of the benefits of buying a multi cook pressure cooker is that you can replace other appliances by having all the functions in 1 cooker. Most people buy a pressure cooker to be able to cook foods quicker and all in one pot, in our busy lifestyles being able to create a meal in a pot quickly is a bonus. When you have more time you may prefer to set off a slow cook meal on a morning so it’s ready in the evening, with the Instant Pot Duo 7 in 1 you can use the slow cook function and use your pressure cooker as a slow cooker, you can choose a heat level, saute your meat and vegetables beforehand in the same pot before setting it to cook. You also have a delay timer that can help too in timing things just right. If thats not enough you have a rice cooking function so that you can cook your rice in there in place of a rice cooker. If you want to steam your food you can also steam in the instant pot with the steam function, you just don’t engage the pressure valve when you’re cooking. You also have a yoghurt making function in this appliance another option that can help do away with another kitchen gadget. The Instant Pot Duo 7 in 1 comes in 2 sizes. You can get all of the great functionality mentioned above but now you can choose what size you would like to buy. There is only about £15 difference in price to be able to buy an 8 litre size of pressure cooker to the normal sized 6 litre size. For most families the 6 litre is sufficient in size to feed them all but if you have a large family or you like to cook bigger meals so that you can freeze some for another day then you might be interested in going for the Instant Pot Duo v2 8 Litre. You can also cook larger pieces of meat or chicken with the larger pot if you like to pressure cook your meat or slow cook it. Just because the Instant pot 8L uk has a larger pot doesn’t mean you have to fill it whenever you cook, you can cook smaller portions too, it just gives you a bit more flexibility. When you buy an item from a well know name like Instant Pot there is usually more options of accessories and with these pressure cookers you can buy various items to give you more capabilities when cooking. For example you can buy extra inner pots, you can buy silicone covers so you can store it in the fridge. You can also buy a ceramic version too. You can buy a silicone steamer basket to hold vegetable or meat and fish or you can buy steamer baskets with dividers so you can keep your vegetables separate. There is the option to buy a glass lid so that when you use the slow cooker function you can have a lid which you can see through to check on the progress of your meal rather than having to keep removing the pressure cooker lid. A lot of people would like to have spare sealing rings as they tend to absorb the smells of cooking and you can get different coloured ones from Amazon so you change them out easily. You can’t get past the price of the Instant Pot Duo, it isn’t the cheapest pressure cooker out there although I have to say it’s not the most expensive either. If you look at all the functions that you can use on the Instant Pot then you might feel its a price worth paying, especially if you are likely to use them, but if you aren’t going to take advantage of the different ways of cooking then you might find you would be better off with a more basic model of electric pressure cooker. There are a few complaints online about the size of the inner pots on the instant pot. The 6 Litre size does give you a 6 litre pot but you can’t pressure cook with it full so you can only fill to about 4.5 litres, and that is the same for the 8 litre size you can cook around 6 litres in that one. I can understand the irritation about it but to be honest that covers any kind of pot appliance, I don’t know any supplier that advertises the actual cooking volume. One of the positives about the Instant Pot is the stainless steel inner pot but it can also be a negative, it gives you the longevity of stainless steel and the benefits of not having non-stick layers but it is like any other stainless steel pan, things can burn on and stick to it. You have to weigh up whether the non-stick issue is important enough to you to deal with the sticking on the base. You can try a ceramic pot which is available as an accessory. 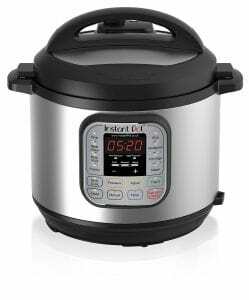 The Instant Pot 7 in 1 uk will always be one of the most popular electric pressure cookers, it is a little more expensive than others but it also has a lot of functionality which you don’t find in other pressure cookers. Most other options out there have non-stick inner bowls, if the health scares worry you with non-stick then the Instant Pot’s stainless steel inner pot is the best choice. With the different size options and their built in safety features I would recommend the Instant Pot 7 in 1 uk version above others out there. Buy the Instant Pot Duo 7-in-1 Electric Pressure Cooker at Amazon.co.uk and get free delivery.